Rydale Self-cateringWithout a doubt the keynote of this charming and attractive Victorian apartment is the huge bay window in the sitting room from where you have a panoramic and ever-changing view over the rooftops, beyond the church spire to Todd Crag in the west and the majestic Fairfield Horseshoe rising to just under 3000 feet beyond the northern flanks of the village. Keen walkers will be happy to know that these tops, together with Wansfell and Loughrigg can be tackled without any need to use the car and with Ambleside centre right on your doorstep you will be able to enjoy all the village facilities - well stocked individual local shops, excellent pubs and restaurants, two cinemas, tennis, bowls and mini-golf. Don't miss a cruise on Lake Windermere - England's largest lake which is within easy walking distance. 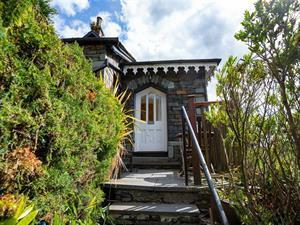 Accommodation: The property is built from traditional Lakeland stone and is in an elevated position. It is reached up a number of steps and a sloping path to the front door. Entrance hall. The spacious sitting/dining room has its original Victorian fireplace - now a decorative feature (32 inch plasma TV with Sky Freeview, BT TV and BT sport, video, DVD, CD/radio, Bluetooth speaker, and free Wi-Fi), high moulded ceiling, and sweeping views as described above. Well-equipped kitchen in light wood. There are two bedrooms - a good sized double to one end of the hallway overlooking the village and the church spire, and a second double at the other end. The second room, though smaller, has been carefully planned with a built-in cupboard, pyramid shaped ceiling and two windows with good views. Fully fitted bathroom (bath with shower over, basin and wc). Rydale has fitted carpets throughout and is comfortably furnished. It is mainly decorated in pastel colours creating an up-to-date feeling without spoiling the character of the property. Gas central heating and hot water. Outside: Private patio area outside the front door with views and garden seating. Parking for unloading is in a shared private area just outside the property and a parking permit is supplied (for use on local car parks). Rydale offers weekly bookings starting on Friday.